During a 2700 match April 12th. A friend of mine had a cartridge failure, attached is a picture of the cartridge. It blew the grips off of the gun and severely blackened the shooters hand. No damage to the hand. The follower was blown down into the body of the magazine. The shooter received a slight cut from powder or debris on his cheek just below his shooting glasses. At the time we all assumed it was a double loaded cartridge. The shooter is using a Dillon Square Deal loader which has auto indexing and in 25 years has never had a double loaded case. The pistol was a Colt series 70. Subsequent metallurgy tests showed no damage to the gun. The slide had to be beat open. On April 22 during our local practice the same thing happened to the same shooter with a different pistol, a Springfield 1911. Again it blew the grips off the gun and blackened the shooters hand. A little more damage to the shooters face, being struck with powder or debris in the scab that had formed from the prior incident with several dots of tattooing scattered below it. This was the first cartridge in the magazine. 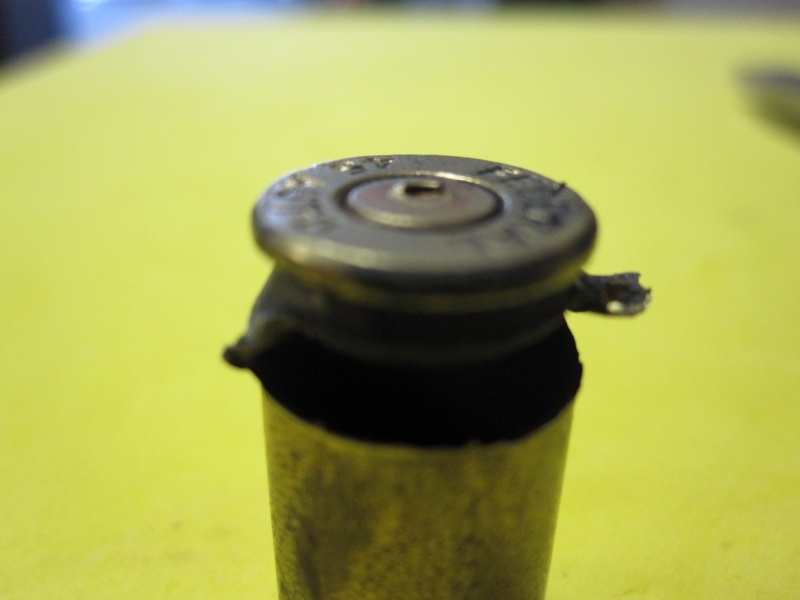 The cartridge below it had the bullet severely dented from the nose to the shoulder and pushed back into the case. That bullet's case had a piece of brass from the failed case imbedded in it. We could not get the slide open at the range. The shooter is using cast 200 grain semi-wadcutter bullets with with 3.9 grains of Clays powder. I did not ask what primer he was using. All of the remainder of the ammunition in his box were all the same overall length and appeared correct. They were tapered crimped and I could not measure their diameter at the range. He was using Federal brass that has been reloaded innumerable times, but not range pick-ups. What was left in the box was freshly polished and appeared in good shape. The shooter is not now convinced he is double charging. He says he checks what weight the powder measuring is throwing before he begins reloading each time. Anyone have any experience with this? Any ideas? Would 8 grains of Clays do this with that weight bullet? With a normal charge of powder there is almost nothing that you can do to a .45 ACP case to make it fail like that. Not "glocking" and not from cleaning chemicals. If you load indiscriminately, without verifying your powder charge either visually or with a lock out die, you're going to get this sooner or later. In forty years, I've seen a half dozen overcharges or double charges in 1911s, all from ammo loaded on progressive reloaders. Luckily, there were no serious injuries. But, it was sad to see fine pistols by Giles and Clark destroyed that way. As a result, I continue to use an accurate scale, well-maintained RCBS uniflow powder dispenser, and RCBS Rockchucker. It may be the slow, old-fashioned way but I've not had a problem. Just because You load old school does not protect you from making a mistake, I use a hornady LNL and a Dillon 1050, both now are equipped with the RCBS lock out dies, I make a mistake they stop the press and will not allow a over charged or a under charged case to go past that station. Its the only sure way to prevent these issues. DavidR wrote: Case is a federal, from base to far side of blowout is .2670, another point as to it being a double charge is the primer is raised and firing pin hit is blown back out. Same as the case in the OP's picture. Plus since installing the lock out dies ive shot thousand's of rounds with no further incidents. David, have you investigated as to how "overcharge" a powder drop must be for it to cause the lock-out die to stop press operation? The reason I ask is that Clays is supposedly dangerous at even 20% overcharge. Some powders are rather "bulky" while others are denser. Obviously, the RCBS lock out die works based on mechanical displacement with the depth of powder displacing a probe. But powders like Clays, known to have small working ranges of min-to-max, could be problematic with this approach Just curious? S.D.B. Uses proprietary dies, so can't use lock-out die. Also, only 4 stations. Have any retrieved cases shown any bulges?